So for any of you that follow this blog regulalry, we try to share information and events about our family whether it be anecdotes or just stories that we would like to throw out to the world for anyone to read. Well if you have read my past Father's Day and Mother's Day posts, you can hopefully understand how important family is to me and my siblings, especially when it comes to our amazing parents. Well, today, in addition to wishing my Father and all Fathers out there a happy day, I want to share with you another reason why my father truly is a Super Man in our eyes. In case you have not read my past posts, I became a father last year for the first time. It was a beautiful moment that was quickly shadowed with bad news. Three days after my daughter was born, my father was diagnosed with an aggressive form of leukemia. My family's world was turned upside down. My father went through a few months of grueling chemotherapy and then is leukemia went into remission. It was a great time. My father responded well to treatment and was able to slowly get back to his life. We were all happy. We were able to celebrate his 70th birthday and he couldn't have been happier. Then, eight months after his final treament, the leukemia came back. This time, he had the accompaniment of a malignant brain tumor. I cannot tell you the sense of hopelessness we all felt at that time. However, my father has always been a strong minded person. When we get mad at him, we call it being stubborn or thick headed, but this is one of my father's "Super Powers". So my father tells the doctors to "do what they have to do". Now, just to explain my family a bit, we remind ourselves to always be grateful for what we have and to make the best of what is going on in our lives. So picture my father lying in a bed about to have brain surgery. His Wife & Five children are all around him with also his best friend there. No one knows how my father is going to come out of this. I mean, the surgeon is going to go deep into my father's brain and try to take out as much of this tumor he can. So what are we doing while at my father's bedside? We're cracking jokes and making my father cry laughing. Yep, my dad's having the fight of his life and we are trying not to lose our bodily functions while laughing. Well my father came out of a successful surgery and began to heal. After about two weeks, we took my father to a cancer center to begin treatment for the leukemia. I do not want to bore you with the details but this round of treatment was definitely more difficult for my father, but he never complained and my mother, who has literally not left his side since this all began, has been finding strength somehow, like finding loose change hidden in the couch, to do things that have inspired the most trained nurses. 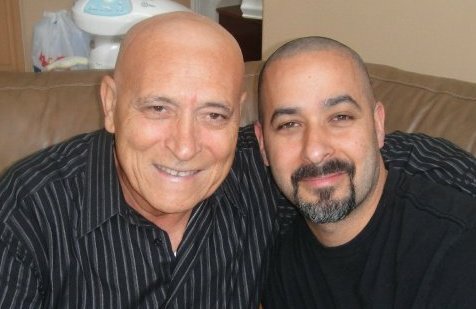 Well, after the first session completed, we took my father home, which brings me to today, Father's Day 2011. Last night, we had a nice birthday dinner for my sister who will be 40 this coming week. My father, was in the hospital due to complications and returned home this past Friday. He's been very weak, but always strong if you can understand that. What I am about to write is like something out a movie. All my brothers and sisters, with our spouses, were to meet at a nice restaurant with a few of my sister's friends. The possibility of my parents showing up was on our minds, but we knew that it was a longshot. Well I can tell you what happened next happened in slow motion to me. "They're here!" on of us said as we looked out the restaurant window. I motion to the door and in comes my father, in a suit! A dapper double breasted suit, tie, fancy shoes, and a swagger that told me that if my father wants to do something, no one, I mean NO ONE! better tell him he can't. And my mother was so beautiful by his side. It was the best birthday gift my sister could have receieved. My dad sat down, received kisses and hugs from all of us. He looked at us, with a littlle welling of the eyes (I'm fighting back tears of pride writing this. That's right! Tears! If you have a problem with that, meet me out back!) My father said, "I did this for two people. My daughter and my wife." Now if you haven't experienced someone going through major chemo, you may not understand how weak they are and how difficult it is to just sit up. But he sat with us and we had an amazing dinner, sang happy birthday and had cake (there was also some drinking). After that, one of my brothers and I took my parents home so they can rest. They did something for their family that still has me in awe. Then, we returned to the rest of the family, went next store to a dance club. We reunited and what did I do? I danced like a complete idiot! Why? Because my dad has been sticking his proverbial middle finger to his illness and getting away with it! And also because I love my family so very much, and as long as we are together, our lives will continue to be blessed. I apologize for the rant. Usually, if you read last years post, I try to write about feelings and try to keep everything nice and loving, but at this point, I am beaming! I wish to stand on high and yell through this megaphone (blog) and share something that needs to be shared. Happy Father's Day Dad, I love you beyond words can say and Happy Birthday to my sister Anne. We are so lucky to have our parents. And to those who saw me dancing like an idiot last night, that's what happens when your dad is a walking miracle. You try to walk on water yourself. Happy Father's Day everyone! Thank-You for such a loving and touching story. God Bless you and your loving family. You are in our thoughts and prayers. God has truly blessed you all with the gift of one another. And thank you for taking the time to read this. It means a great deal to us all and your well wishes do provide strength. Thank you again. I NEED A BOX OF KLEENEX!!!!!! WOW!! What a lucky man to have such a wonderful family in a world where families are falling apart over bullcrap!!! Much love and luck to your father and keep being the son, husband and father your father taught you to be. Happy Fathers Day Gary.